Video (08:50) : Gophers coach Richard Pitino, Jordan Murphy and Reggie Lynch talk after Saturday's win against Florida Atlantic. Nate Mason’s return to full strength after Saturday’s injury scare could be the key to the Gophers’ hopes of contending for an NCAA tournament berth and in the Big Ten this season. So you can imagine the relief for some fans when the team announced Saturday night that the left ankle injury that looked very bad for Mason was day-to-day after an MRI revealed no major damage. Minnesota’s next game is a week away on Dec. 30 against Harvard at Williams Arena, but the most important date is the continuation of Big Ten play Jan. 3 against Illinois and Jan. 6 against Indiana at home. 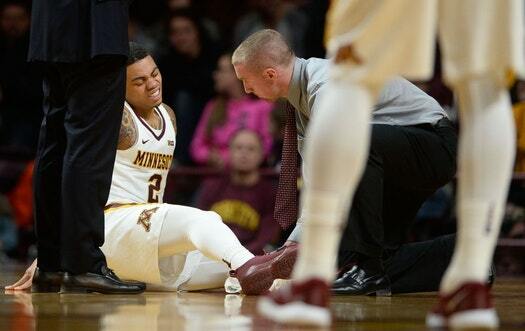 The Gophers are saying Mason didn’t suffer a serious injury, but even minor ankle sprains can linger for weeks depending on where they are located. Mason is arguably the Big Ten’s top point guard, which he showed with 17 points on 5-for-9 shooting from three-point range in Saturday’s 96-60 win against Florida Atlantic. The 6-foot-2 senior captain is averaging 15.4 points, 4.4 assists and 42.9 percent shooting from three-point range. In his last two games, Mason is shooting 9-for-16 from beyond the arc (56.2 percent). Minnesota can’t replace his scoring or leadership, but it will help if Mason’s backcourt teammates continue to develop. Freshmen guards Isaiah Washington and Jamir Harris might be ready to play bigger roles at some point this season, but they’re still both learning to be more consistent in key areas, especially defensively. Junior Dupree McBrayer and sophomore Amir Coffey are Mason’s fellow backcourt starters, but McBrayer has missed the last two games with a lower leg left injury. He’s still not cleared to play in the next game Dec. 30 against Harvard. Coffey is the most likely candidate to help replace Mason’s playmaking and facilitating in the short term. He’s capable of leading the team in scoring, but recently he’s been the Gophers’ best assist man. He has 15 assists and two turnovers in the last two games. -- The Gophers tied their season high with 11 three-pointers Saturday against Florida Atlantic. Mason hit five threes in the first half. Davonte Fitzgerald and Jordan Murphy hit their third three-pointers this season. But Harris also shot 3-for-5 from beyond the arc. He had nine points and four assists in 20 minutes. -- Junior center Reggie Lynch ended his double figure scoring drought with 11 points on 4-for-4 shooting from the field Saturday. Lynch scored under double digits in four straight games. -- Gophers assistant coach Ed Conroy's son, Hunt, made his first appearance this season Saturday. The freshman walk-on guard scored his first career basket in spectacular fashion with a double-clutch reverse layup late in the second half that made the crowd go wild.